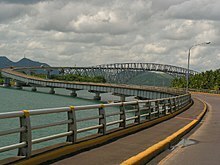 The list of bridges is a link page for any bridges that are notable enough to have an article, or that are likely to have an article in the future, sorted alphabetically by country. 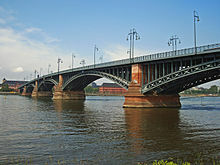 Great Belt Bridge, between Halsskov on Zealand and Knudshoved on Funen, second longest section span of 1.6 km. Bandra-Worli Sea Link is considered one of the most stunning bridges in India. The Howrah Bridge spans the Hooghly River, linking Howrah to Kolkata, India - the busiest cantilever bridge in the world. Lejonströmsbron, 207 m. The oldest wooden bridge in Sweden, from 1737. Lidingöbron, 997 m. There was a 750-metre-long (2,460 ft) bridge there already 1802. Bosphorus Bridge (Boğaziçi Köprüsü), Istanbul, connects Asia and Europe. 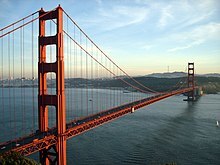 The Golden Gate Bridge spans the Golden Gate.